LOS ANGELES (June 1, 2016) – Dunn-Edwards Paints has introduced New and Improved DURAFLO® Premium (50) Semi-gloss and (60) Gloss paints lines. These are interior enamels formulated with advanced waterborne alkyd technology, ideal for use on interior walls, trim, moulding, cabinets, doors, kitchens, baths and high traffic areas. New and Improved Duraflo 50 and 60 Premium lines develop hard, durable finishes that have excellent adhesion, hide, block resistance and reduced yellowing. 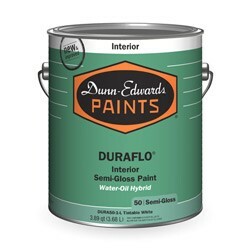 Like all Dunn-Edwards paints, New and Improved Duraflo 50 and 60 lines do not contain ethylene glycol (EG). Dunn-Edwards removed EG from its paint formulas in 1984, and remains the only major manufacturer to have done so. EG, which is listed as a hazardous air pollutant and toxic air contaminant, can be harmful to humans.